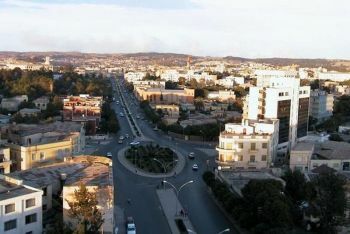 Asmara (Asmera) is the largest city and capital of the modern state of Eritrea. It was also the capital of Eritrea when it was a colony under Italian rule. Asmara is located in the highlands of Eritrea on the edge of the Great Rift Valley. With an elevation of 7,628 feet it is one of the highest cities in Africa. Because of its elevation, the city experiences a mild climate and is in the most agriculturally fertile area of the country. In 1889 Asmara was occupied by the Italians during the Scramble for Africa. It became their colonial capital of Eritrea in 1897 and soon afterwards a rail line was built from the coast to the city. During the Italian occupation, Asmara was split into separate sections, with the Italians and other Europeans taking up most of the city, leaving the native Eritreans with the undesirable parts of the urban area. The colonists also westernized the city, changing its name from Asmera to Asmara. They often referred to it as “Piccola Roma” or Little Rome. The city began to flourish in the 1930s when Italian architects and city planners designed and constructed many of the now-famous buildings and broad boulevards. Italian influence was also reflected in the multiple coffee bars and pizzerias. By 1939 Asmara had a population of 98,000 of which 53,000 were Italians. Italy lost control of Eritrea in 1941 to Great Britain. The British administered Asmara until 1952 when the United Nations placed Eritrea under temporary Ethiopian control. In 1961 Ethiopian Emperor Haile Selassie declared Eritrea to be the 14th province of Ethiopia, touching off a thirty year war for independence. While the city of Asmara did not experience extensive damage from the war, the residents were still impacted. Under Emperor Selassie’s rule, all industrial factories in Asmara were dismantled and reassembled in Addis Ababa, the Ethiopian capital, resulting in a local economic slump. Also parts of Asmara such as Mariyam Ghimbi were used to hold and torture prisoners during the independence war. The war ended on May 24, 1991 when Eritrea resistance troops forced the surrender of the Ethiopian Army outside the city. Two years later Eritrea was recognized as an independent country with Asmara as its capital. The Eritrean government has worked to improve the infrastructure, since improvements to the city had been neglected during the thirty years of war. Asmara today is known by tourists and residents alike as a peaceful, enjoyable city with a 2003 population of approximately 600,000. Edward Denison, Guang Yu Ren, and Naigzy Gebremedhin, Asmara, Africa’s Secret Modernist City (London: Merrell, 2003); Anthony Appiah and Henry Louis Gates, Africana: The Encyclopedia of the African and African American Experience (New York: Basic Civitas Books, 1999). American Experience (New York: Basic Civitas Books, 1999).